Fort Mill and Tega Cay are located along the I-77 corridor in the northernmost part of South Carolina, literally on Charlotte’s, North Carolina’s border, and are among the fastest growing communities in the state, increasingly serving as a “bedroom” community for the city of Charlotte. 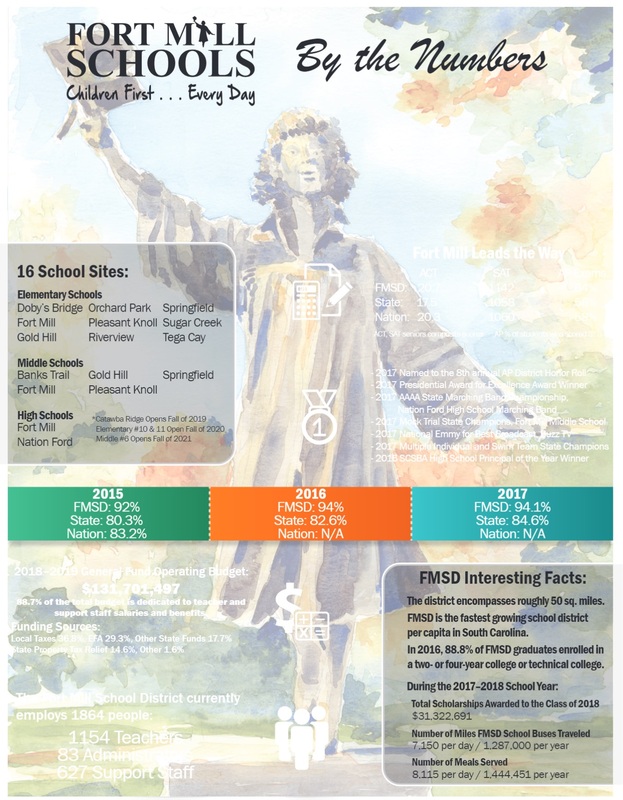 The combination of proximity to Charlotte, low taxes, high-performing public schools and a family-friendly atmosphere have been contributing factors to the exponential growth of both Fort Mill and Tega Cay. Tega Cay has grown 103% and in the city of Tega Cay some 88% of residents were born outside the state. In the town of Fort Mill, 75% were born outside the state of South Carolina. Fort Mill and Tega Cay provide easy access to public access areas of Lake Wylie and to numerous public marinas. Boating, fishing hiking, horseback riding and golfing are all readily available activities in Fort Mill and Tega Cay. Fort Mill is home to approximately 50,000 residents. From Fort Mill, you can be in Uptown Charlotte in under 25 minutes or in Ballantyne and Pineville in 15-20 minutes. Depending on where you’re starting from, the Charlotte Douglas airport is no more than 30-minutes away. Fort Mill is an active community with plenty of events and amenities. Fort Mill features the Fort Mill Community Playhouse and Fort Mill History Museum. The annual Strawberry Festival is popular with residents from all around the Fort Mill area. Residents enjoy visiting Fort Mill’s Anne Springs Close Greenway. This nature preserve offers visitors the opportunity to participate in hiking, kayaking, mountain biking, horseback riding, camping, and fishing. The preserve hosts summer concerts, a Fall Frolic, horse shows, a Winter Wonderland Holiday Market, a Fiddle ‘n Pig Shindig, and much more. Those who prefer golfing may want to check out Springfield Golf Club and Fort Mill Golf Club. Both of these golf clubs are private with a membership requirement. Major employers in Fort Mill include Lash Group, Movement Mortgage, Daimler Trucks North America, US Foods, Ross Stores, Cardinal Health, Comporium, CitiFinancial, and Duke Energy. In Polynesian, “tega cay” means beautiful peninsula, which is the perfect way to describe Tega Cay, South Carolina. This beautiful 1,600-acre peninsula on Lake Wylie is just 20 miles south of Charlotte, North Carolina. Just 2.5 square miles in size, the Tega Cay community began developing in the 1970’s and was originally modeled after a Polynesia resort. It includes the Tega Cay Golf Club, a 27-hole golf course, a marina, the Tega Cay Beach & Swim Center, tennis courts at the Tega Cay Tennis Club, walking trails, waterfront parks, ball fields, and so much more. The town has its own Police Department, Fire Department, and Emergency Services Squad. Originally developed as a gated vacation community in the 1970’s, Tega Cay is now an upscale, lake-side community with some 16 miles of Lake Wylie shoreline, providing a high quality of life, reasonable cost of living, and top-rated public schools. Its small-town feeling provides security and comfort. Sitting on Lake Wylie, it also provides virtually year-round recreation, including boating, golf, tennis, and more. Tega Cay’s Park and Recreation Department is home to more than 4,500 participants annually and features youth baseball, flag football, soccer, and softball. But adults are not left out with adult softball, kickball, and senior games. Where else would you find both youth and adult croquet games? If you’re a golfer, the Tega Cay Golf Club is minutes away. But you’ve also got six more golf courses within 10 miles, as well as 27 parks, and two hiking trails. Windjammer Beach Park on Lake Wylie is popular with Tega Cay residents. Important services such as gas stations, ATM’s, cleaners, pharmacies, grocery stores, medical services are all close by, as is the Rivergate Shopping Centre at the intersection of NC 49 and NC 160, which is home to a Super Target, grocery store, a Home Depot, PetSmart, Best Buy, and many other shops and restaurants. Fort Mill and Tega Cay homes range in style from rustic cottages, to patio homes, to single family homes, to waterfront mansions, to town homes. Home prices can go as high as $1.8 million for waterfront homes on Lake Wylie. 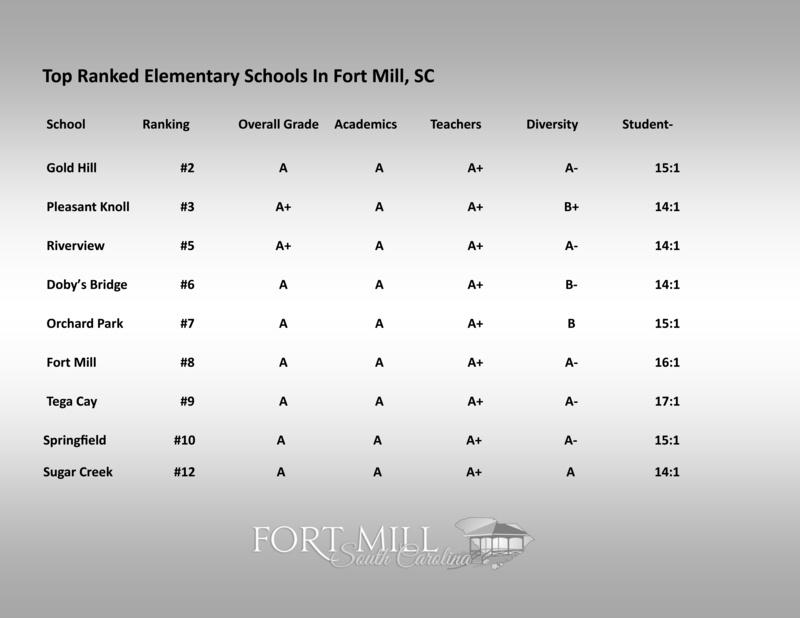 Fort Mill, South Carolina is home to nine of the 20 best elementary schools in the Charlotte metro area according to the 2019 Best Public Elementary Schools study by Niche.com. Using a combination of U.S. Department of Education data and its own surveys, Niche.com gave a 50% weight to academics grade; a 20% weight for teachers grade; 15% weight for overall district grade; 10% weight for culture and diversity grade; and 5% weight for parent and student surveys on overall experience. More significantly, eight of these top nine schools are also ranked in the top 10 schools in the Charlotte metro area. And that is a major reason that Fort Mill and Tega Cay homes are in such great demand by families moving to the Charlotte area? Your real estate agent is the best source of information about the local community and real estate topics. Give Nina Hollander a call today at 704-779-0813 to learn more about local areas, discuss selling a house, or tour available homes for sale in Fort Mill and Tega Cay. She’s been opening doors for Fort Mill and Tega Cay home buyers and sellers for 20+ years. Find out how Nina Hollander is the difference you can count on. You’ll be glad you did!